I have yet to visit a tennis stadium and while I have the luxury of the world’s largest just an hour and a half away, I’m thinking that I work my way up to it the next several years, in time for the renovations at the whole USTA Tennis Center to be completed. In the meantime, there’s good tennis during the summer to check out in Toronto, Montreal, DC, New Haven and the Cincy area…all within drivable distance. Obscured in the background of a jam-packed March sports scene, there is also high-quality tennis in the States this time of year as well. 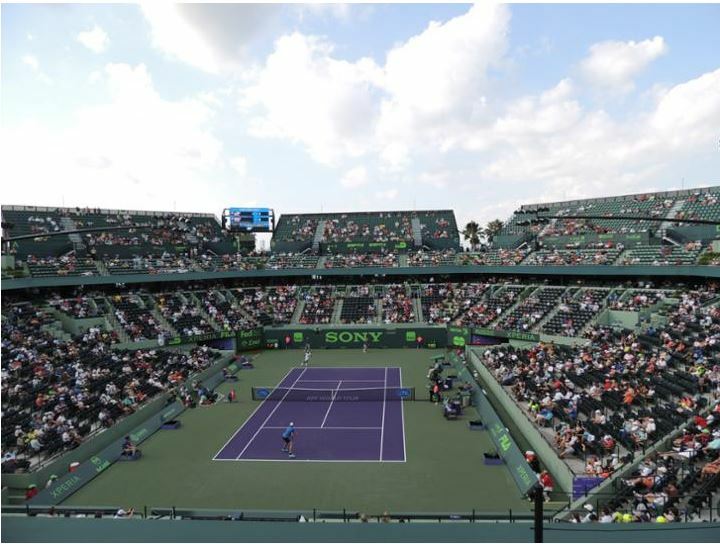 After starting at Indian Wells (a terrific facility in it’s own right), the ATP/WTA is now in the Miami area, where they spend the next week at the Tennis Center in Crandon Park, a venue well worth visiting. Crandon Park is located on Key Biscayne, about 10 minutes southeast of downtown Miami. While it is a pain to get here because of the Causeway and it’s accompanying tolls/traffic, the park itself is home to gorgeous beaches. Other entertainment include the Miami Seaquarium and the Rusty Pelican, a restaurant with a spectacular view. There are ten competition courts in the complex and the primary Stadium Court seats 13,800. The configuration has a few little nooks and crannies, but the main takeaway is the lack of suites allow for excellent sightlines as seats are angled towards the court in an octagon shape. The daytime includes a great view of the city skyline from the south stands, but it also mean that you are sitting in an increasingly hot Florida sun. Evening sessions feature more comfortable weather and the vibe is also much better with energetic crowds. Really, spending the whole day at the tournament is the way to go as there is so much to take in and watching the world’s best in matches around the grounds is a rare opportunity. No worries about food as the Miami Open is known for amazing options in their Plaza. Lunch and dinner is a great break in between matches. If you want to check out this tournament, you may want to go soon. Planned (and needed) renovations failed to go through in the always crazy world of Florida sports stadiums. There are rumors that if the tennis center is not upgraded, the tournament may leave the area, which would be a sad end to a tradition nearly 30 years old.